For today’s Destination of the Week, I went to the mid Atlantic to visit a Nordic island country in between Europe and the US that has both geographical and cultural traits of each. We are heading to Reykjavik, Iceland. 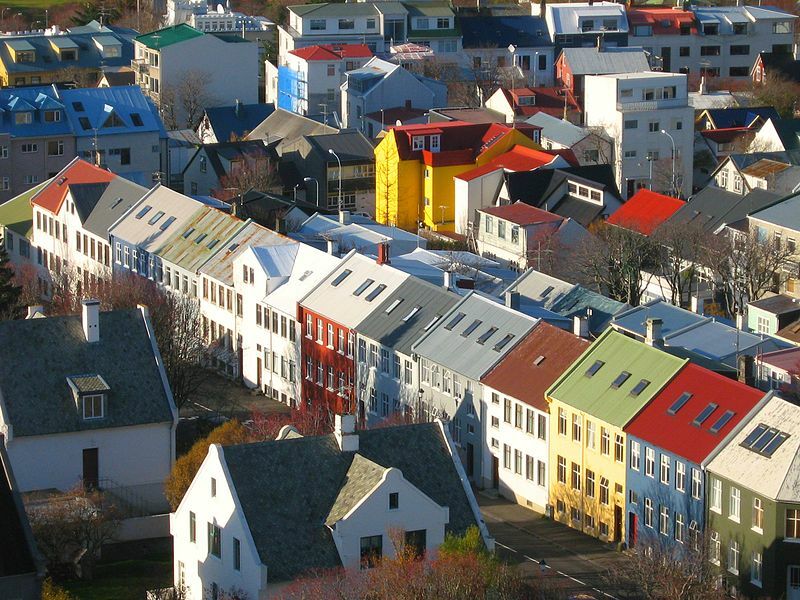 The distinctive colored rooftops of Reykjavik. A city of contrasts from the harsh volcanic landscape and frozen glaciers to the rich culture and ancient Nordic heritage, Reykjavík is located in the southwestern region of the country and is home to two-thirds of the country’s population. The capital is believed to have been the country’s first populated area by Viking Norsemen in 870 C.E., however the city itself wasn’t founded until 1786 when it was developed as a trading town, and has since grown into the center of commerce and government. Despite the growth over the years since it was first under Danish rule, Reykjavík is still known as one of the cleanest, safest and most organized cities in the world. 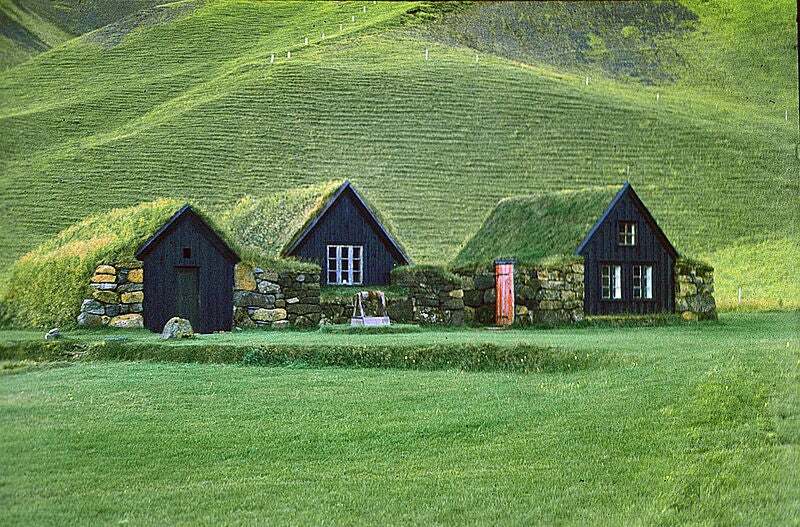 Traditional turf houses still blend into grassy hillsides. Reykjavík became a melting pot for Icelandic nationalism in the 19th century and in 1894 the country was finally given its own constitution. It was hit hard during the Great Depression and then occupied by Allied British and US troops in World War II despite the country’s pledge to stay neutral. The American invasion led to the construction of Keflavik Airport, which remains the international entry for visitors today. After being shaped by earthquakes and volcanic eruptions for millennia – like all of Iceland – nowadays Reykjavík is centered around a quaint downtown area that spreads out into low-density suburbs, with the salmon-filled Elliðaár river running through it and the frozen peaks of the Esja mountain range to the north. A must-do for those who aren’t afraid to put their faith in four hooves is a horse-riding tour. Icelandic horses are known for their small, sturdy stature and gentle natures – along with a unique gait called the called the skein, or “flying pace.” Having evolved from a now-extinct breed of Scandinavian workhorses, visitors can try out the skein for themselves on tours with companies such as Islenski Hesturinn Riding Tours who will take you on adventures over the volcanic landscape. Tours last around 2.5 hours long with just about 1.5 hours of riding. The price for the morning and afternoon tours are ISK 10,800 ($88.75) per person while then evening 8pm tour costs ISK 15,800 ($130) per person. Included in the price is the rental of helmets, rain gear, boots and gloves. 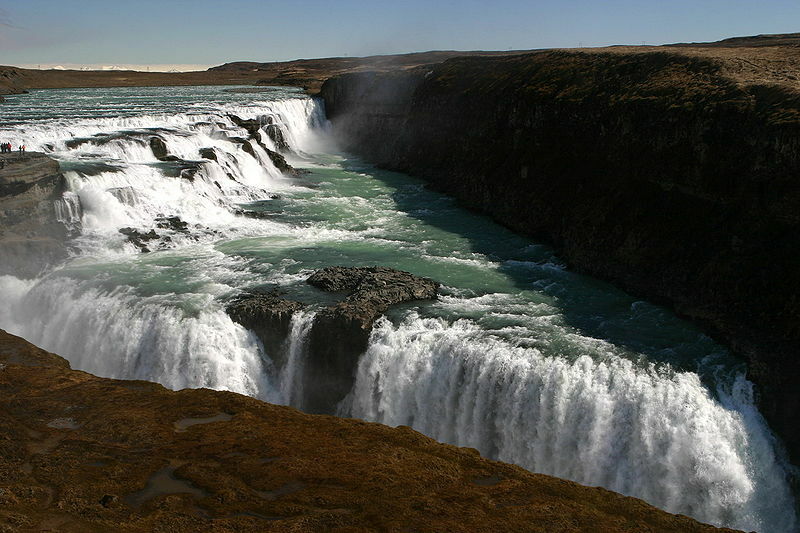 Gullfoss is a dramatic waterfall plummeting to a crevice 105 feet below. Iceland’s famous Ring Road (or Route 1) is 832 miles of breathtaking scenery from black sand beaches and fjords, past thermal fields and crater lakes. The Suourlandsvegur section connects Selfoss to eastern Reykjavík, while Vesturlandsvegur goes from there to Borganes. Creative tour guides while away the hours on the road with the island’s unique mythology and tales of strange beasts, legends of giants and dwarves, or mythical creatures inhabiting the frozen depths of the Atlantic. The route inland from Selfoss takes you to thermal field at Geysir and the Gullfoss (meaning Golden Falls), a frigid waterfall that plunges down three steps to a crevice 105 feet below. 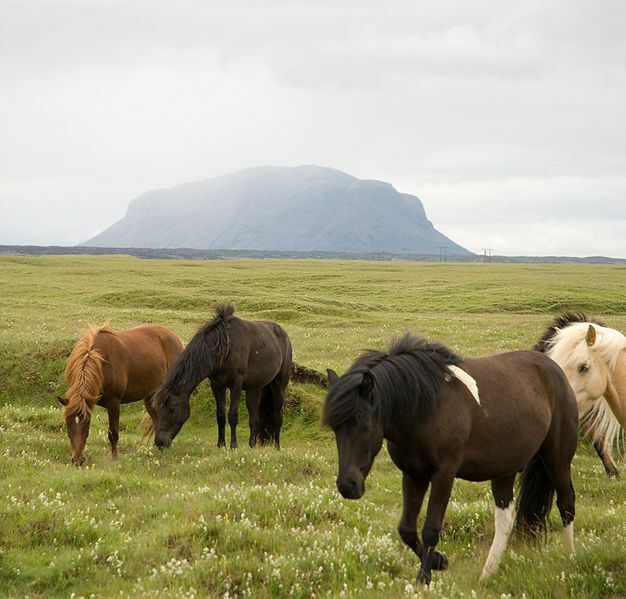 The best way to see the Ring Road is on a tour such as those hosted by ExperienceIceland, who create personalized trips lasting from just one day to much longer. Reykjavík Excursions hosts the Golden Circle Tour, which picks you up from your hotel and then takes in the Gullfoss falls, the river, and Þingvellir National Park, which is being pulled apart by American and Eurasian tectonic plates, and the Friðheimar greenhouse cultivation centre. Prices start at ISK 9,100 ($74) for a day trip in July. The Strokkur is known to erupt every five to 10 minutes. 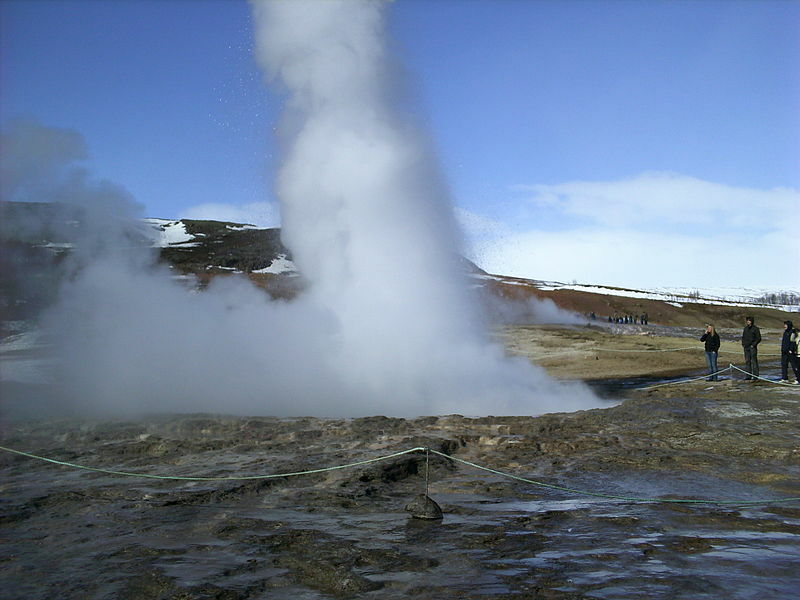 For the more self sufficient adventurer, you can also rent a SUV and drive yourself to spectacular natural sites, such as the Geysir Geothermal Area where there is about a 100m wide strip of land that the hot springs are aligned on. The Strokkur, which is the most energetic geyser in Iceland, is known to erupt every five to ten minutes. Humpback whales are some of the spectacular creatures you can spot on a whale watching tour. Once a historical whaling hub, it is not surprising that whale watching is now a popular activity in Iceland. Controversial commercial hunting of fin whales recently resumed, but most visitors still simply want to see these majestic creatures in their natural environment. Tour companies such as Elding Whale Watching set sail from the old harbour of Reykjvaic, which is close to many of the most popular hotels. Be sure to dress warmly as most tours last up to three hours and it can get chilly on the water. If you are prone to sea sickness, it is a good idea to take a suitable remedy in advance as the ride is sometimes (very) rocky. The peak season is May to August, when if you are lucky, you can spot Humpback, Minke, Orca, Blue or Fin whales frolicking in the ocean. If booking with Elding, for adults the tour costs ISK 8,000 per person, for children ages 7-15 tickets are ISK 4,000 and ages 6 and under ride for free. Of course, one of the most popular attractions in Iceland is the Blue Lagoon, a stunning complex of geothermal pools in a volcanic landscape that is conveniently located en route to and from Keflavik Airport (many folks stop here either after they arrive or before they depart) where visitors can soak in the balmy pools (temperatures average 98-102 degrees Fahrenheit), get massages and even have a meal at the LAVA restaurant. Dining out in Iceland can be an adventure in itself, with curious culinary experiences such as lamb’s heart, fermented shark, and salt-cod mousse popping up on menus, not to mention an array of whale and puffin options available at restaurants such as Hereford Steakhouse. For something a little simpler, Baejarins Beztu Pylsur (located next to the Radisson Blu 1919 hotel) is famous for its signature lamb hot dog topped with crunchy onions. They are open 24 hours, so it’s the perfect place for late night munchies caused by too much Viking Beer or jet lag. Other popular spots are the Borg Restaurant, serving authentic Icelandic ingredients like fish, lamb, beef and vegetables, and Grillmarkadurinn, which has a huge charcoal grill where they cook up horse, whale and fish. For more information on things to do in Reykjavík, check out my post about my recent trip here. 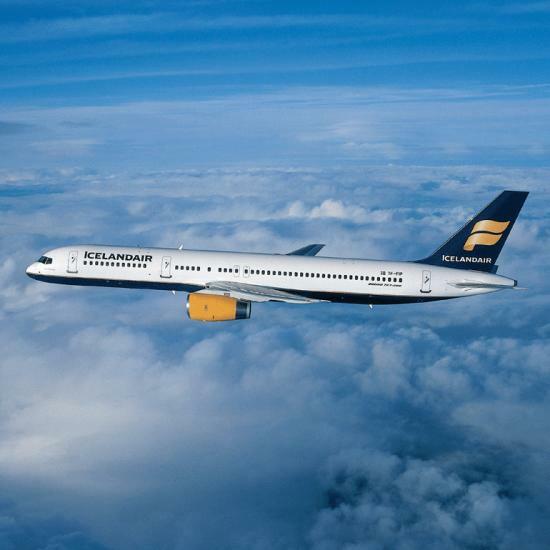 Icelandair use Keflavik International as a hub airport. 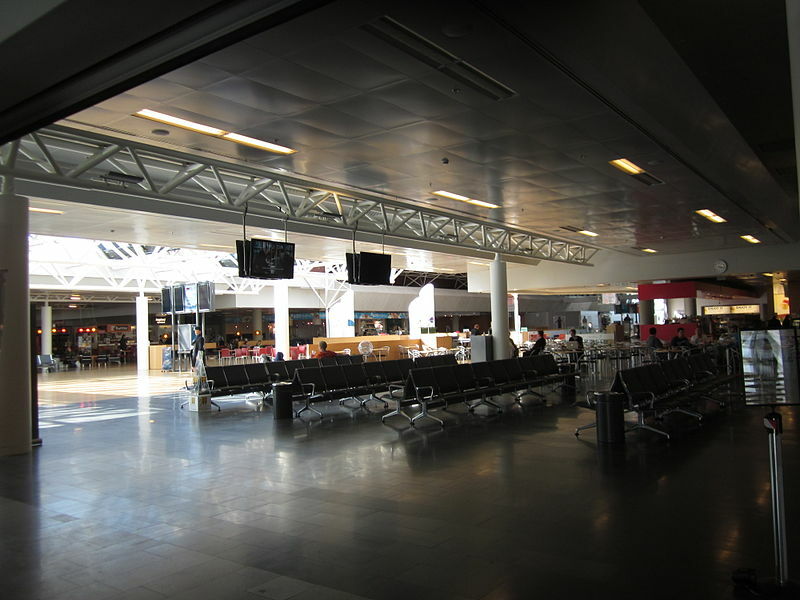 Keflavík International Airport (KEF) remains the entryway for travelers from both the US and Europe. Located 31 miles south of Reykjavík, the main carriers into Keflavík are Icelandair and WOW Air. The airport currently only has one terminal named Leifur Eiríksson Air Terminal (named after Leif Ericson), but there are plans to either expand it or build a second terminal in 2014 or 2015. Domestic flights go to and from the smaller Reykjavík Airport, which is just 1.9 miles from the city center. The Terminal at the Keflavik International Airport. International carriers servicing the airport include seasonal Delta service to JFK (See Flight Review of Delta JFK-KEF), Air Berlin, Air Greenland, Austrian Airlines, easythe jet to (England and Scotland), and Scandinavian Airlines. When it comes to Star Alliance partners, Lufthansa flies to Berlin, Dusseldorf and Hamburg. Due to the distance from downtown, cheap ground transportation is tricky getting to Keflavík. The Airport Express bus takes 45 minutes and offers complimentary pick-up/drop-off service from all major hotels in the capital area (be sure to book 24 hours in advance. Alternatively, the Flybus leaves 35-40 minutes after arrival of each flight and drops passengers at a number of city destinations including the BSÍ Bus Terminal. The bus costs around 2.200 ISK or $17. Budget, Avis and Hertz all operate rental cars from the airport, or a taxi from Reykjavík costs about 14,000 ISK or $115. The Scandinavian-style décor at the Radisson Blu Saga hotel. Radisson Blu Saga Hotel: This 209-room hotel offers views of the Reykjavik city centre, the sea or the beautiful University of Iceland campus. 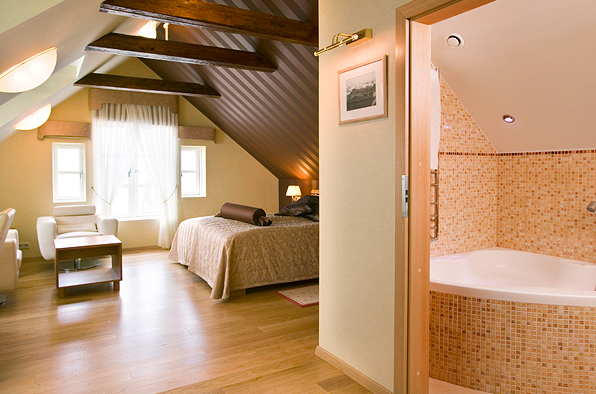 The rooms have complimentary WiFi, flatscreen TVs and Anne Sémonin bath products in the marble bathrooms. The Business Class rooms and suites are furnished with a Nespresso coffee machine and free room service for breakfast. There are three on-site dining options: The Grillio restaurant is eight stories above street level and offers views of the city and fine dining. Restaurant Skrudur is more basic with buffets for breakfast (only in winter), lunch and dinner, plus a huge fireplace to huddle around. Mimisbar and Lounge has burgers, beers and colorful cocktails. There is also a fitness center with weights and cardio machines to burn off all that traditional Icelandic food, and a full-service spa offering massages along with a seawater Jacuzzi, sauna and steam room. Room rates start at 190 EUR ( $248) per night in July. This is a Category 4 hotel requiring 38,000 Club Carlson points for a free night. The historical Radisson Blu 1919 hotel in the city center. Radisson Blu 1919 Hotel: The Saga’s sister hotel, the Radisson Blu 1919 is located in the Reykjavik city center and has 88 studio-concept rooms and suites with complimentary WiFi, hardwood floors and marble bathrooms. Loft-style suites have natural skylights, a private Jacuzzi and Nespresso coffee machine. The dining options are the 1919 Restaurant, serving local ingredients and in-season produce, and the 1919 Lounge for creative cocktails, cool beer and a light menu. There is also an on-site fitness center. Room rates start at per night 249 EUR ($325) per night in July. This is a Category 5 hotel requiring 44,000 Club Carlson points for a free night. The bright and cheery lobby bar at the Hilton Reykjavik Nordica. Hilton Reykjavik Nordica: This 252-room hotel has complimentary WiFi, restored timber-beamed ceilings, Venetian fabrics and marble bathrooms. It is located in the heart of the city in the triangle that connects the new city center, the historic and the business district, within 5 minutes of the Laugardalur outdoor activity park, which has an outdoor swimming pool, botanical garden and animal zoo. Pampering options at the NordicSpa include the signature Ice and Fire treatment or the rebalancing health benefits of an Ayurvedic Massage. There are also steam rooms, sauna, hot tubs, a relaxation pool, gym and personal trainers on-site. The hotel bar offers lively nightlife, or the Library allows you to curl up around a fire built around the ashes of an Icelandic volcano. The VOX restaurant offers creative, wholesome new Nordic cuisine, along with a lunch buffet, brunch and high tea. Room rates start at 42,500 ISK ($345) per night in July. This is a Category 7 hotel and requires 40,000 (30,000-60,000 seasonally) HHonors points for a free night. 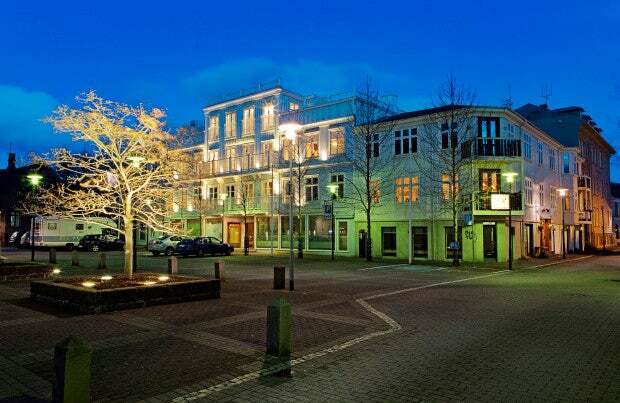 Kvosin Downtown Hotel: Located in the hear of Reykjavík, the Kvosin Downtown Hotel is within easy walking distance of cafés, bars, clubs, museums, concerts at the Harpa and the Icelandic parliament. This eclectic (which is very imaginatively described on its website) hotel has just 8 rooms ranging from “tiny” size to “larger than life,” for a four-person suite. All have bright and lively decor, and most include ample kitchen areas, complimentary WiFi, a 32 inch flatscreen TV and Nespresso coffee maker. Built in 1900, the hotel was once an apartment building that was home to both the Public Reading Society and the Icelandic Templar community, who held meetings in what is now the gourd floor wine bar. Room rates start at 240 EUR ($315) for a “tiny” room including breakfast per night in July. 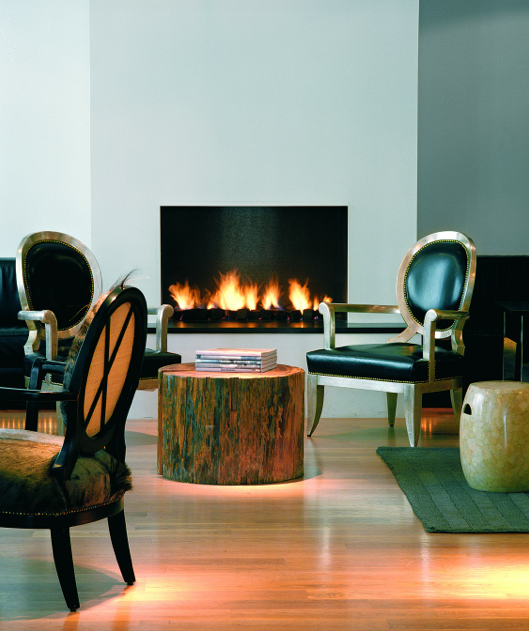 The stylish fireplace at the art decor 101 Hotel. 101 Hotel: Another boutique property, the 101 Hotel has 38 rooms and suites with sleek, modern designs, a large walk-in shower, complimentary WiFi, flatscreen TV, underfloor heating, CD/DVD player, a Bose iPod dock, and Aveda bath products. The starkly decorated 101 Restaurant with its glass ceiling is described as “one of the trendiest places” in town to dine, serving a combination of modern Icelandic and international cuisine. There is also business center and a luxurious basement gym, steam room and jacuzzi, or in-room massages are available. The 101 is a member of the Design Hotels group and showcases a fascinating collection of modern art in its on-site gallery. Room rates start at 64,790 Krona ($532 or 404 EUR) per night in July. The loft-style Junior Suite at the Hotel Plaza. Hotel Plaza: A member of the Center Hotels group, the Hotel Plaza has 180 well-appointed rooms with bright, unique modern décor and contemporary oak furnishings, complimentary WiFi and a flatscreen TV. The Plaza Lounge and Bar offers light snacks and Happy Hour drink specials every day, while business travelers with appreciate the extensive meeting areas and fully-equipped conference rooms, including projection unit, computer rental and sound system. Room rates start at 105 EUR ($138) per night in July. Exterior of the Holt Hotel. 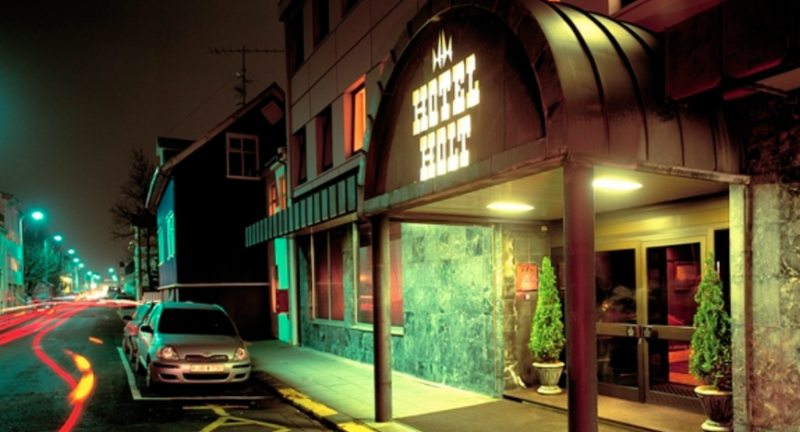 Hotel Holt: This basic boutique hotel is located in the heart of old Reykjavík and has 40 rooms with complimentary WiFi, flatscreen TVs, and original Icelandic art adorning the walls. The Gallery Restaurant is run by master chef Friðgeir Ingi Eiríksson, and serves traditional Icelandic food in an elegant setting. Wine tasting over the over 4,000 vintage wines in the walk-in cellar can be a fun way to start off dinner. Room rates start at 225 EUR ($295) per night in July.